Last month, the Bombay High Court passed an order to shift IPL matches scheduled for the month of May out of the state of Maharashtra citing an acute water shortage in some parts of the state for its decision. PRS Legislative Research, answers some basic questions about ground water and its depletion in our country. Earlier this month, Members of Parliament in Lok Sabha discussed the situation of drought and drinking water crisis in many states. During the course of the discussion, some MPs also raised the issue of ground water depletion. Last month, the Bombay High Court passed an order to shift IPL matches scheduled for the month of May out of the state of Maharashtra. The court cited an acute water shortage in some parts of the state for its decision. In light of water shortages and depletion of water resources, this blog post addresses some frequently asked questions on the extraction and use of ground water in the country. Q: What is the status of ground water extraction in the country? A: The rate at which ground water is extracted has seen a gradual increase over time. In 2004, for every 100 units of ground water that was recharged and added to the water table, 58 units were extracted for consumption. This increased to 62 in 2011. Delhi, Haryana, Punjab and Rajasthan, saw the most extraction. For every 100 units of ground water recharged, 137 were extracted. In the recent past, availability of ground water per person has reduced by 15%. In India, the net annual ground water availability is 398 billion cubic metre. Due to the increasing population in the country, the national per capita annual availability of ground water has reduced from 1,816 cubic metre in 2001 to 1,544 cubic metre in 2011. Rainfall accounts for 68% recharge to ground water, and the share of other resources, such as canal seepage, return flow from irrigation, recharge from tanks, ponds and water conservation structures taken together is 32%. Q: Who owns ground water? A: The Easement Act, 1882, provides every landowner with the right to collect and dispose, within his own limits, all water under the land and on the surface. The consequence of this law is that the owner of a piece of land can dig wells and extract water based on availability and his discretion. Additionally, landowners are not legally liable for any damage caused to water resources as a result of over-extraction. The lack of regulation for over-extraction of this resource further worsens the situation and has made private ownership of ground water common in most urban and rural areas. Q: Who uses ground water the most? What are the purposes for which it is used? A: 89% of ground water extracted is used in the irrigation sector, making it the highest category user in the country. This is followed by ground water for domestic use which is 9% of the extracted groundwater. Industrial use of ground water is 2%. 50% of urban water requirements and 85% of rural domestic water requirements are also fulfilled by ground water. 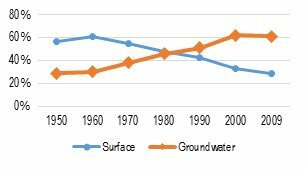 Figure showing ground water vs surface water utilisation for irrigation over the years. PIc: PRS Legislative. The main means of irrigation in the country are canals, tanks and wells, including tube-wells. Of all these sources, ground water constitutes the largest share. It provides about 61.6% of water for irrigation, followed by canals with 24.5%. Over the years, there has been a decrease in surface water use and a continuous increase in ground water utilisation for irrigation, as can be seen in the figure alongside. Save groundwater or ground democracy? Q: Why does agriculture rely most on ground water? A: At present, India uses almost twice the amount of water to grow crops as compared to China and United States. There are two main reasons for this. First, power subsidies for agriculture has played a major role in the decline of water levels in India. Since power is a main component of the cost of ground water extraction, the availability of cheap/subsidised power in many states has resulted in greater extraction of this resource. Moreover, electricity supply is not metered and a flat tariff is charged depending on the horsepower of the pump. Second, it has been observed that even though Minimum Support Prices (MSPs) are currently announced for 23 crops, the effective price support is for wheat and rice. This creates highly skewed incentive structures in favour of wheat and paddy, which are water intensive crops and depend heavily on ground water for their growth. It has been recommended that the over extraction of ground water should be minimized by regulating the use of electricity for its extraction. Separate electric feeders for pumping ground water for agricultural use could address the issue. Rationed water use in agriculture by fixing quantitative ceilings on per hectare use of both water and electricity has also been suggested. Diversification in cropping pattern through better price support for pulses and oilseeds will help reduce the agricultural dependence on ground water. Agricultural Statistics at a glance, 2014, Ministry of Agriculture; PRS. Section 7 (g), Indian Easement Act, 1882. Legal regime governing ground water, Sujith Koonan, Water Law for the Twenty-First Century-National and International Aspects of Water Law Reform in India, 2010. This was first published by PRS Legislative Research on their blog, and has been republished with permission.